Israeli Prime Minister Binyamin Netanyahu called on opposition leader Isaac Herzog (Zionist Union) to apologize to Jews living in Judea and Samaria for calling them a "virus" in an interview with Army Radio on Monday. "I can't believe Herzog would use the word 'virus' to describe Jews in Judea and Samaria. They're part of us, part of our country. They serve in the IDF, they contribute to the country's future and economy. Bougie, apologize immediately!" Netanyahu said. "Judge Gronis said, 'I understand the pain of these families' and I say he understood the pain and gave you two years to evacuate, and now see what this virus has done to the State of Israel," Herzog said. "See how dangerous it is to Israeli democracy and to the fact that we have to sacrifice lives just because of this stupid nonsense." On Sunday night, the Ministerial Committee approved the Regulation Law, which is meant to prevent the expulsion of Amona's residents and those of the other towns in Judea and Samaria. 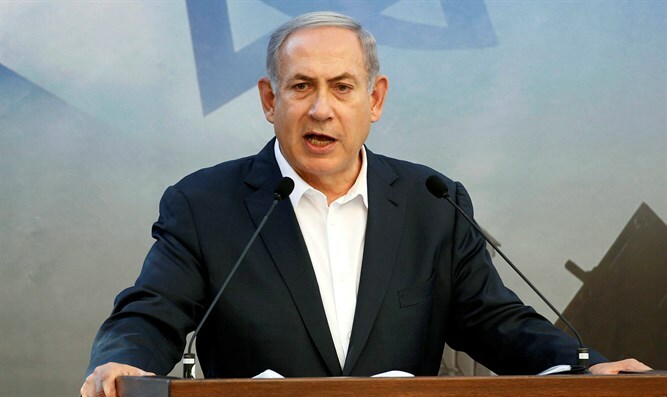 The ministers unanimously voted for the Regulation Law, after PM Netanyahu finally agreed not to delay the vote an additional time, and in opposition to the advice of Attorney-General Avichai Mandelblit. At the beginning of the government's meeting, Netanyahu said, "Two weeks ago, the government submitted a request to delay Amona's expulsion by half a year. This request was submitted with the approval of all coalition parties. The Attorney-General has said explicitly that voting on the Regulation Law before the Supreme Court approves our request to delay Amona's expulsion may severely hurt - and it really will severely hurt - the chance of Amona receiving the requested extension." Netanyahu also added that, "On the other hand, there has recently been a push to pass the law in time, in case the Supreme Court rejects our request. Therefore, today the coalition party heads will meet and we will examine, logically and responsibly, the options we have. I want to emphasize, there's no one who worries more about Judea and Samaria more than we do. And here, too, we need to work logically and responsibly for the sake of all of Judea and Samaria."